Officer Shawn Fulgado, 45, used to go to Japantown Bowl with his father, Max, who worked maintenance in Japan Center. His work partner, 38-year-old Officer Yuka Nagamine spent her early years in Japantown because her parents worked and owned restaurants in the area. Besides a beat, they share a nostalgia. “The bowling alley isn’t there anymore,” he said. “Yeah, we miss that a lot,” she said. 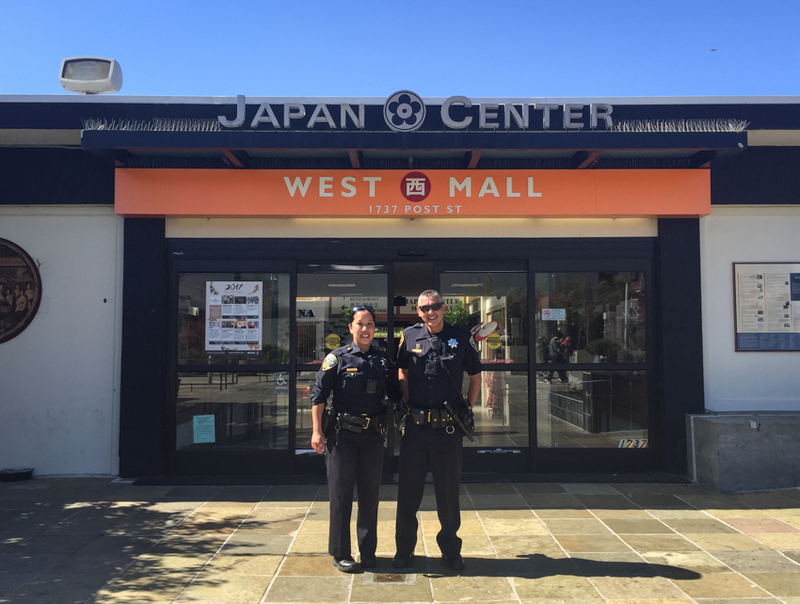 Both officers grew up frequenting Japantown, which is part of the Northern police district. Nowadays, it’s their beat – they walk it 5 days a week from Sutter to Geary and Fillmore to Laguna streets, ducking in to say hello to merchants. It is a relationship that Police Chief Bill Scott would like to see happen more often. Last month, Scott announced he would increase the number of foot patrols on San Francisco’s streets. Community policing is one of the five major areas that the Justice Department’s 2016 report recommended improvement on, and the captain and others view foot patrols as essential. “True community policing is giving cops foot beat assignments consistently – to build trust and form relationships,” said Commander David Lazar, who is head of the Command Staff’s Community Engagement Division, which was created in February of this year. Seven months later, Scott announced plans to increase the number foot patrols and more changes aimed at bolstering community engagement. Nagamine had been on foot patrol for about a year and a half; Fulgado joined her shortly after. They are the kind of officers that Jaimerena would like others to model after – officers who want to walk a beat. “That’s part of it: taking pride in your work and location,” Jaimerena said. Other than having an email chain with community leaders, Nagamine and Fulgado do their best to talk to as many community members as they can in person. In a way, it’s something Nagamine had always wanted to do. “I was born and raised in San Francisco, and this is my way of giving back to the community where I grew up,” she said. Nagamine joined the SFPD about three years ago. She started working as a beat cop after a community meeting where her superior asked if she wanted to walk the Japantown beat. “I said ‘sure why not, I grew up there’,” she remembers. Nagamine’s parents, Taka and Nasumi Nagamine, owned a restaurant in one of the Japan Center buildings called Ku Shin Bo. They sold it about ten years ago, but they still work in the community. For Fulgado, the beat is about contributing to the same community he saw his dad working in for about three decades. Even though Japantown is not one of the major hotspots for crime in the city, it does have many cases of auto burglaries. Community members are aware of the break-ins and appreciate the presence of their beat cops. In part, it might be thanks to these relationships. “It is important for the community to have a dynamic relationship with the people who protect us,” said Peter Yamamoto, a volunteer at the Japanese American Historical Society and a member of the community for the past 35 years. Gregory Wood, owner of Forest Books, a business that has been open in the area for five years, echoed the sentiment. He added. PreviousRincon Nayarit — seafood from Mexico’s western coastline in SF’s Mission!